Let me say first of all that my faux pas of overlooking the Luminists' latest excursion into the literary caverns of Shaverdom is most distressing to me. I can only toss this one off as dero tamper. And even though this is not a recently discovered lost Shaver manuscript, it is still a worthy addition to your Shaver Library. 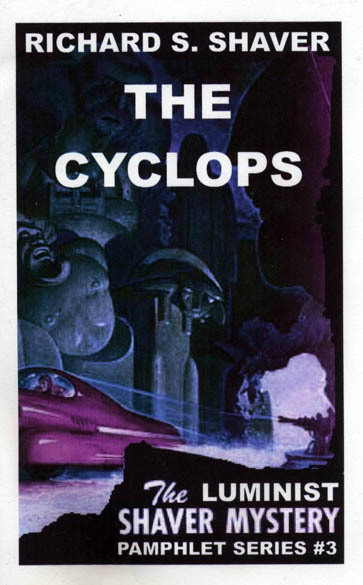 "The Cyclops" is the third Shaver Mystery Pamphlet of their series. The first two..."I Contacted an Unknown Race" and "A Plot Against Our Lives" are still available as well. 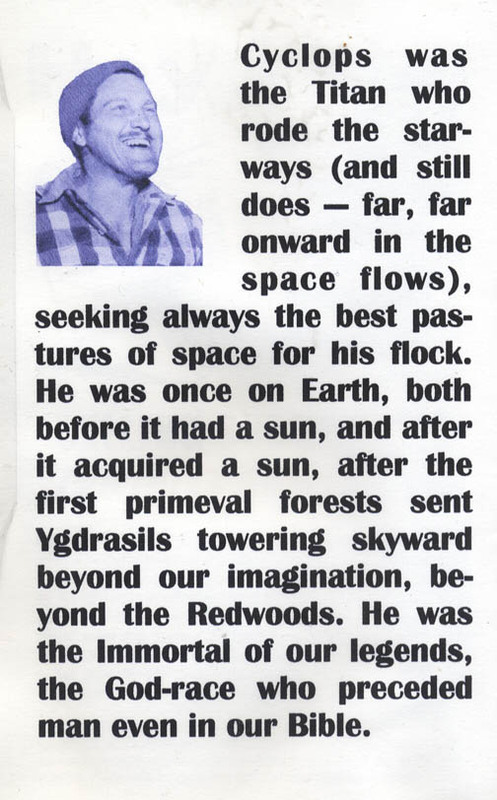 As the back cover explains, this story has Old Man Shaver delving into the mythology of the SM, bringing us those giant times of yesteryear, when "The ancient temples of Greece were built upon the tremendous ruins of the temples of the Cyclops." Also included in this reprint of a 1955 issue of Mystic Magazine is Shaver's "Mene, Mene, Tekel, Upharsin"(reprinted from Dissenter/Disinter magazine Nov. 1967). It has been awhile since I (Figbar Tobar) have perused this particular article by Shaver. In it, The Man himself dips deeply into the well of Mantong to show us lowly ones that there never was anything "occult" about the Shaver Mystery. These tidy Luminist publications are nicely printed and covered in a protective plastic dust jacket to shield it from the detrimental rays of the Sun. The Luminist Shaver Mystery Series is available by subscription. The Rates are 6 issues for $25...12/$50...24/$100, or -- and this is Figbar's recommendation -- the Lifetime Sub for only $500, though I am not sure whose life we are talking about here. If you do not have long to live, a single copy is only $4.99 plus $2 USA and $4 beyond USA shipping. Send your order today, to Lumninist Publications, P.O. Box 35091, Syracuse, NY 13235 USA. IV. Follow the teachings of Richard Shaver or forever be dero. (Well, that is not really a Luminist teaching...it is my humble hyperactive opinion).